Black Friday and Cyber Monday Tire Deals are almost here! These are some of the best deals you'll see all year. Get ready for winter weather with a fresh set of new tires. Take up to $100 off your order at TireBuyer! This is one of the biggest sales of the year! Walmart's Black Friday 2018 tires ad scan. $20 off Goodyear tires and Free Lifetime Balance and Rotation! Discount is calculated off Walmart's listed prices on their website as of 11/18/2018 (discount % subject to change at any time). Links open in a new browser tab. 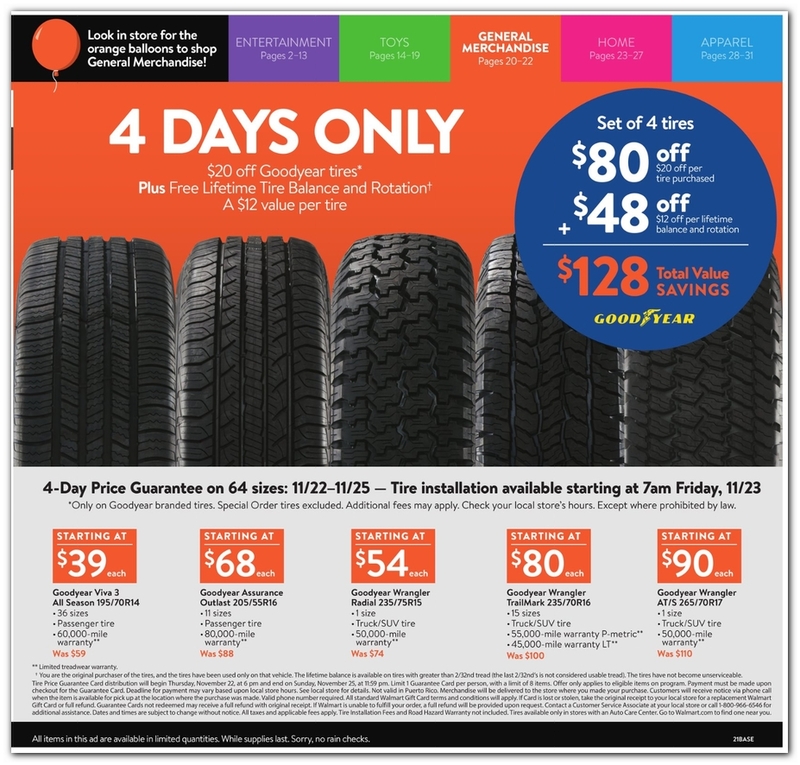 Discount Tire and America's Tire Black Friday and Cyber Monday deals! Get up to 20% back on a prepaid MasterCard! Click a banner or link below to order for in-store pickup and/or installation to ensure the tires you want are in stock. How this works is there will be several discounts you might be eligible for. For example, tires marked as "Best" will be eligible for the most discount (look at the label underneath each tire photo in your search results). You can also qualify for more discounts if you use or sign up for the Discount Tire store credit card. Manufacturer rebates also apply. Pep Boys has a Buy 2, Get 2 Free deal for Black Friday! Installation at Pep Boys is required. A search in Amazon's Black Friday category only matches on some tire accessories. Nevertheless, we fully expect Amazon to automatically match other retailers' pricing on Black Friday and Cyber Monday tires. In the past, BJ's Wholesale offered discounts plus free installation on Michelin and BFGoodrich tires. Check the link below to see their current deals. Costco is featuring a hot $129.96 instant savings on a set of Michelin tires, or $70 on a set of Bridgestone tires. NTB has a promotion for Buy 2 Tires, Get 2 Free, with the purchase of installation services. They have several other deals going on as well. Link opens in a new browser tab. Big O Tires is featuring double rebates on Michelin, BFGoodrich, and Goodyear tires, if you use their store credit card. They also have Buy 3, Get 1 free sales on Cooper and Nitto tires. They're also providing no interest on credit if paid in full within 12 months. Firestone, Tires Plus, and Wheel Works have several offers, which require installation in-store. Links open in a new browser tab. Get $100 off instantly at Goodyear Tire! Buy a select set of 4 tires and get up to $200 back in a mail in rebate when you use the Goodyear Credit Card. Restrictions apply. See site for full details. Offer valid thru 12/31/18. Tire Rack doesn't appear to be running any Black Friday specials, but their prices are usually quite competitive, and are worth a look. There are usually several rebate offers going on.